The Body Shop has launched Elixirs of Nature, five new fragrances (Nigritella, Kahaia, Swietenia, Bowhanti and Widdringtonia) capturing exotic botanicals with headspace technology. Smell out of this world with our NEW Elixirs of Nature fragrances. From the mysterious allure of woody Widdringtonia to the sun-kissed petals of Kahaia, our incredible new collection recreates some of the rarest & most precious natural scents on Earth. Nigritella ~ Oriental; The Alps, Switzerland. 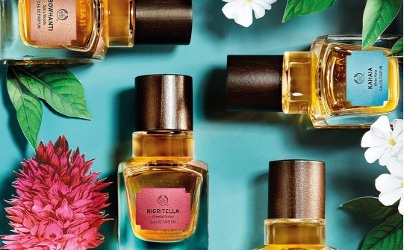 (probably Nigritella nigra) "Nigritella is luxuriant floral fusion of Red Vanilla Orchid, enhanced with a hint of tuberose and vanilla for fiery sensuality. The fragrance instantly transports you high in the Swiss Alps where this plant blooms. The profusion of hot floral exhalations, nectar and pollen makes for an opulent oriental fragrance that seduces with every breath." Kahaia ~ White floral; Bora Bora, Polynesia. (probably Guettarda speciosa) "A white floral bouquet starring the Kahaia flower, combined with an enticing bouquet of Jasmine Sambac and creamy Benzoin for a luminous touch. It is only during the nocturnal hours does the Kahaia bush emanate its most tranquil and luminous white flower scent." Swietenia ~ Fresh floral; Bangalore, India. (possibly Swietenia mahagoni, although that is native to the West Indies.) "The subtle floralcy of Mahogany flower combined with a sparkling breeze of orange flower and bigarade leaf result in a delicate freshness. This fragrance instantly transports you to the humid planes of Bangalore, South India, as its scent keeps you vibrant and crisp on a balmy evening." Bowhanti ~ Spicy woods; French Guiana. (probably Vouacapoua americana) "A spicy woody scent, Bowhanti from the Wacapou tree is combined with a smoky blend of patchouli and incense. This is a thoroughly modern spice fest with all the mythical enigma and allure of resonant woods and piquant notes. This fragrance will transport you to the French Guianan tropical rainforest." Widdringtonia ~ Aromatic cedar; South Africa. (probably Widdringtonia wallichii) "A woody aromatic mash up of Clanwilliam cedarwood, with a warm trail of sage and vetiver for an earthy sophistication. It takes you to the species’ spiritual home in South Africa’s Western Cape: a breath of fresh air, blown through wood, at the summit of the Cederberg Mountain range. Widdringtonia is unique and definitively edgy on a daring woman." The Body Shop Elixirs of Nature Nigritella, Kahaia, Swietenia, Bowhanti and Widdringtonia are available in Eau de Parfum. The series has launched in the United Arab Emirates; I will update with sizes and more distribution information when I can. Update: The Elixirs of Nature will launch in the US in 2017. Umm, Robin, typo alert. Pretty sure you meant headspace rather than headscape in your intro. But headscape technology -> it does sound good! I want some! That was EXACTLY what I was thinking….I would like an escape from my head from time to time! These sound really interesting. Too bad there aren’t any Body Shops within 100 miles. Oh, well! Money saved. Oh, Body Shop. This would have been the PERFECT time to sneak Ananya back into your lineup! Next time call me before you make these decisions! And Wood Musk…man I LOVED that one..why oh why discontinue it!!!!!! It’s already in all the stores where I live, each fragrance is 50ml eau de parfum. I may come back with an update if I tried them as the closest store is a few blocks away of my house.